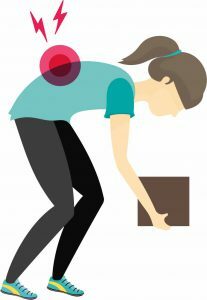 In most episodes of low back pain, a specific underlying cause is not identified or even looked for, with the pain believed to be due to mechanical problems such as muscle or joint strain. If the pain does not go away with conservative treatment or if it is accompanied by “red flags” such as unexplained weight loss, fever, or significant problems with feeling or movement, further testing may be needed to look for a serious underlying problem. In most cases, imaging tools such as X-ray computed tomography are not useful and carry their own risks. Despite this, the use of imaging in low back pain has increased. Some low back pain is caused by damaged inter vertebral discs, and the straight leg raise test is useful to identify this cause. In those with chronic pain, the pain processing system may malfunction, causing large amounts of pain in response to non-serious events. 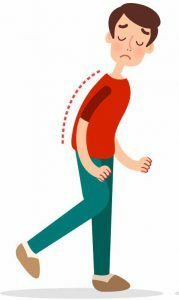 In the common presentation of acute low back pain, pain develops after movements that involve lifting, twisting, or forward-bending. The symptoms may start soon after the movements or upon waking up the following morning. The description of the symptoms may range from tenderness at a particular point to diffuse pain. 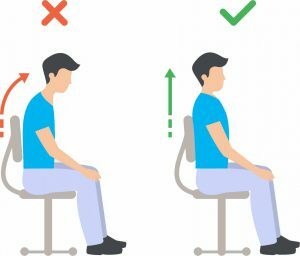 It may or may not worsen with certain movements, such as raising a leg, or positions, such as sitting or standing. Pain radiating down the legs (known as sciatica) may be present. The first experience of acute low back pain is typically between the ages of 20 and 40. This is often a person’s first reason to see a medical professional as an adult. Recurrent episodes occur in more than half of people with the repeated episodes being generally more painful than the first. Abhyangam: A full body massage (Head to Toe) done with Ayurvedic oils. It relieves pains and aches in the joints by lubricating the same, improves blood circulation and channelizes nerve ending. Kati Basti: In Kati Basti, specially prepared warm herbal oil is poured over the lower back and retained inside a well created using black gram paste or whole wheat flour. It is helpful in lower back conditions like lumbar spondylosis, inter-vertebral disc prolepses, lumbago (a low backache), and sciatica. Pizhichil: Pizhichil is the squeezing of warm medicated oil onto the body of the patient from a piece of cloth that is periodically soaked in a vessel containing the medicated oil. Pizhichil literally means squeezing. It helps improve muscle tone and strengthen them thereby providing the much-needed support. Sneha Basti: Sneha Basti involves enema using medicated oil. It is used to treat lower backache, gout and rheumatism. Kashaya Basti: Kashaya Basti involves enema using medicated decoction. It is used to treat lower backache, gout and rheumatism.